Iron is an important dietary mineral that is involved in various bodily functions. It is commonly known for aiding the production of hemoglobin, a protein that helps red blood cells deliver oxygen throughout your body. It also acts as a transport medium for electrons to travel within the cells and is needed for many enzymes to function normally. Maintaining a healthy level of iron in your body is important, yet iron deficiency is the most common nutritional deficiency in the world. If it is not controlled in time, it can lead to iron-deficiency anemia. Some of the common causes of iron deficiency in adults are inadequate intake of iron through diet, chronic blood loss, increased need for iron by the body like during pregnancy, and an inability to properly absorb iron. Women in their childbearing years are at higher risk, mainly due to loss of blood during menstruation. According to the National Heart, Lung, and Blood Institute, about 20 percent of women of childbearing age have iron-deficiency anemia. According to the National Institutes of Health, the recommended daily dietary allowance for iron for 19- to 50-year-old females is 18 milligrams (mg). During pregnancy, women should consume 27 mg of iron per day. On the other hand, the recommended daily dietary intake of iron for men is about 8 mg. Insufficient iron can affect your body in many ways. It is important to be aware of its signs and symptoms, so that corrective measures can be taken right away. 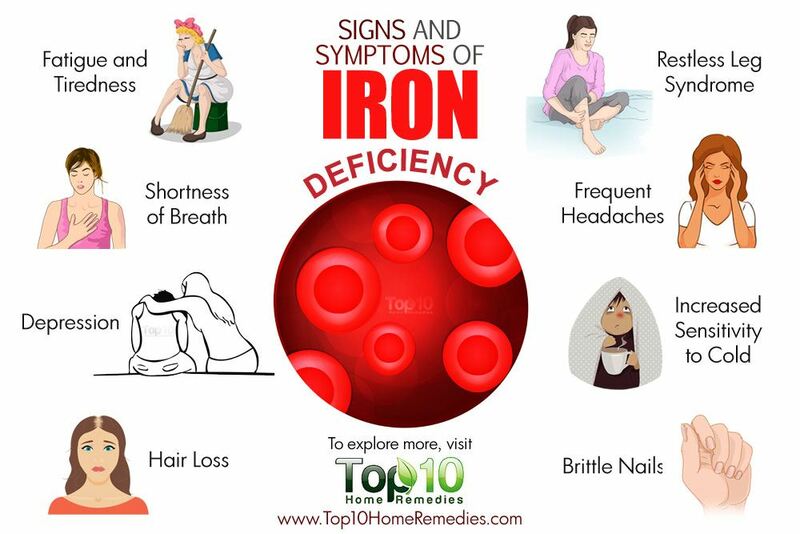 Here are the top 10 signs and symptoms of iron deficiency. Fatigue and tiredness are common in people who have a low iron level. Iron is important for maintaining optimum levels of hemoglobin, which is the oxygen-carrying chemical in the bloodstream. Lack of oxygen in the body causes constant fatigue and tiredness. 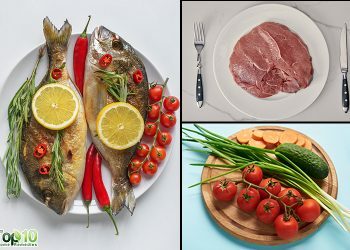 A 2000 study published in Quality of Life Research suggests that iron deficiency is associated with decreased general health and well-being and increased fatigue. Another study published in the Journal of the American College of Nutrition in 2001 reports that dietary and supplement treatment of iron deficiency improved the general health and fatigue in Australian women of childbearing age. In addition, a 2012 study published in the Canadian Medical Association Journal reports that iron supplementation in non-anemic menstruating women with low ferritin helps reduce fatigue. Ferritin is a chemical that aids the storage of iron in the blood. If you are frequently tired and feeling fatigued, get your blood checked to find out whether you have an iron deficiency. Proper diagnosis and timely treatment will help reduce the symptoms quickly. Due to a low iron level, less oxygen reaches different parts of your body. When the body’s oxygen level is low, it will cause shortness of breath, no matter how deeply you breathe. This shortness of breath occurs even while doing things that you’d normally handle just fine, such as climbing the stairs, taking a short walk or even carrying small objects. The breathlessness can be mild, moderate or severe, and breathing often returns to normal after a rest period. If you need to puff for air more often, get your iron level checked to rule out the possibility of this nutrient deficiency. Shortness of breath can also be due to a respiratory infection, chronic bronchitis, heart disease and allergies, all of which may require medical care. Another common sign associated with iron deficiency is pale skin or a washed-out appearance. Due to a low iron level, your body is unable to manufacture sufficient hemoglobin. It’s the hemoglobin that gives your blood its red color and your skin its rosy hue. As the iron deficiency worsens, your skin begins to lose its normal color and becomes pale. This sign is more prominent in people who have a lighter skin tone. Irrespective of skin tone, a low iron level makes the inside of your lips, your gums and the inside of your bottom eyelids less red than usual. 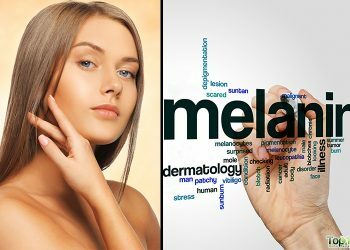 If your skin starts looking paler than usual and you are not sick, consult a doctor to determine the cause. If your nails look pale, fragile and brittle, it can be a possible sign of iron deficiency. Along with brittle nails, a concave or spoon-shaped depression in the nails can indicate an insufficient iron level in the body. A low iron level hampers your body’s ability to produce enough hemoglobin, which helps carry oxygen throughout your system, including to your nails. This lack of oxygen prohibits the healthy growth of your nails. A 2010 study published in Clinics in Dermatology reports that virtually every nutritional deficiency can affect the growth of the nails in some manner and iron is one of them. Apart from nutritional deficiencies, aging, long-term use of nail polish and frequent exposure to water can lead to brittle nails. 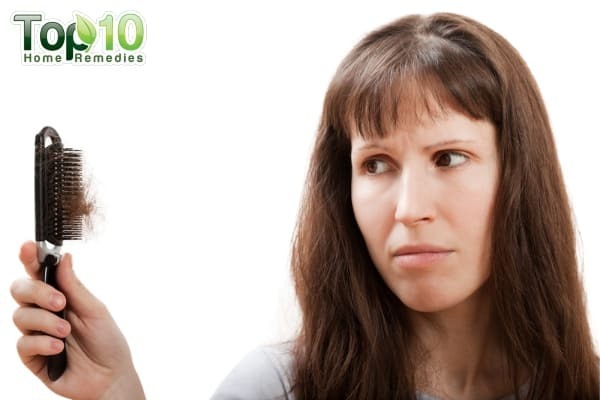 There are many possible causes for hair loss and iron deficiency is one of them. A low iron level sends your body into survival mode, during which it channels oxygen to support vital functions as opposed to less important functions like hair growth. A 2006 study published in the Journal of the American Academy of Dermatology shows that iron deficiency has a much closer link to hair loss than most doctors realize. Adequate iron intake may be the key to restoring hair growth. In fact, women with iron deficiency are at a risk of telogen hair loss, according to a 2009 study published in Acta Dermatovenerologica Croatica. A recent 2013 study published in the Journal of Korean Medical Science supports previous studies and reports that iron deficiency can be a factor in developing or worsening female pattern hair loss, especially in premenopausal women. To find out whether an iron deficiency is the cause of your hair loss, it is important to measure the amount of ferritin in the blood. Pica is a condition in which a person has an unusual craving for non nutritive substances that can cause significant health risks. This condition can be sign of a low level of iron or other nutrients in the body. In a 2010 study published in the Journal of Medical Case Reports, experts considered pica an important sign of iron deficiency that should never be ignored. 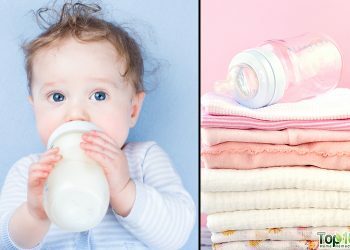 A recent 2014 study published in the Journal of Nutrition found that pregnant teens with significantly lower iron levels had cravings for ice, cornstarch, vacuum dust, baby powder, soap and other nonfood items. If you are craving nonfood items, bring it to the attention of your doctor to find out the exact reason behind it. If you find yourself looking for a sweater or blanket even in pleasant climatic conditions, you can blame it on a low iron level. Iron helps your red blood cells carry oxygen throughout your body, which in turn brings heat and other nutrients to every cell in your system. Without enough iron, red blood cells can’t do their job in the right manner. This leads to increased sensitivity to cold and you shiver more often. Plus, this mineral is critical to proper thyroid gland functioning, which helps regulate your body temperature. When the thyroid gland does not function properlydue to low iron, it causes cold intolerance. This makes you feel cold even in a warm environment. Increased sensitivity to cold is a signal that something is wrong with your body, which a doctor should evaluate. So, make an appointment as soon as possible. Frequent headaches can be caused by an iron deficiency. An iron-deficient body prevents adequate oxygen from reaching your brain. This results in swelling in the brain’s arteries, which causes headaches. This type of headache can make it very difficult to concentrate or relax. A 2000 study published in Acta Clinica Croatica reports that iron-deficiency anemia is more common in women with pure menstrual migraines (PMM) and menstrually related migraines (MRM), which may be an underlying mechanism aggravating migraine attacks. Another study published in the American Academy of Pain Medicine in 2015 also confirms that iron-deficiency anemia is significantly associated with PMM/MRM. However, further research is needed to determine the complex relationships between estrogen, iron metabolism and dopamine dysfunction, and their effects on migraines. No matter what, frequent headaches should not be taken lightly and you should consult your doctor immediately. Maintaining a proper iron level in the body is important for your mental and emotional health. A healthy iron level is essential for cognitive, motor sensor and social-emotional development and functioning, as it helps carry oxygen throughout your bloodstream. One possible effect of a low iron level is lack of oxygen in the brain, which can lead to the development of psychological problems, including depression. A 2013 study published in BMC Psychiatry reports that iron-deficiency anemia is associated with increased risks of unipolar depressive disorder as well as bipolar disorder, anxiety disorder, attention-deficit/hyperactivity disorder (ADHD), delayed development and mental retardation among children and adolescents. However, further research is required to clarify the mechanism in the association between iron-deficiency anemia and psychiatric disorders. While iron deficiency may not be the sole reason behind depression, it can cause symptoms similar to depression, such as a poor appetite, irritability, fatigue and mood swings. Hence, it is always best to consult a doctor. If you can’t stop fidgeting while trying to sleep and it hampers your sleep quality, then you probably have restless legs syndrome. People who have cellular iron deficiency are more prone to suffer from restless legs syndrome. A 2003 study by the National Institute of Neurological Disorders and Stroke links restless legs syndrome to inefficient processing of iron in certain brain cells. The receptors that help cells absorb iron are abnormally regulated in cells that produce the nerve-signaling chemical dopamine. This worsens the symptoms of restless legs syndrome. People suffering from restless legs syndrome can see improvement in the symptoms following iron supplementation. Eat foods rich in iron, such as beef, liver, oysters, beans, fortified cereals, pomegranate juice, beetroot and dark leafy greens like spinach. Make sure to eat enough foods rich in vitamin C, such as bell peppers, berries and broccoli, to boost iron absorption. Avoid too much tea and coffee, especially around meal times, as the tannins in them interfere with iron absorption. You may also need to take iron supplements, but always consult your doctor first. Bear in mind that iron supplements may cause some side effects, such as nausea, digestive discomfort and dark-colored stools. Avoid intake of iron in high amounts. It can damage internal organs and may increase the risk of diabetes, cardiac arrhythmias and liver cancer, particularly in older people. I have been having tooth pain. … Symptom: Sensitivity to hot or cold foods and liquids. .